Be the first to share your favorite memory, photo or story of Dale . This memorial page is dedicated for family, friends and future generations to celebrate the life of their loved one. 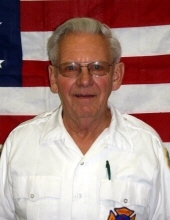 Dale Martinson, age 84 of Radcliffe, IA, passed away on Tuesday, October 16, 2018 at the Hubbard Care Center in Hubbard, IA. Dale Martinson was born on July 6, 1934 the first child of Myron and Ellen (Hildahl) Martinson in Decorah, IA. Dale’s first five years were spent in a small village in Nordness, a short distance from Decorah and adjacent to Ellen’s home farm. Dale began his education in the limestone schoolhouse in Nordness at age 4 years old. After completing one month of Kindergarten the family moved to Gladbrook, Iowa. He finished 1st and 2nd grades and started 3rd grade before his family moved to Forest City, Iowa where he completed his elementary education and graduated from Forest City High School in May 1951. He held a paper route for most of those years. After graduation Dale continued to live at home and attended Waldorf College for two years and worked at the telephone company. On June 20, 1953, Dale was united in marriage to Adoline Maakestad at the Center Lutheran Church rural Leland, Iowa. In August they moved to Decorah where Dale attended Luther College for two years graduating with a B.A. Degree in Science Education. He did some practice teaching at Harmony, Minnesota and Postville, Iowa. Dale signed a contract to teach high school Science at Radcliffe, Iowa in August 1955. He also drove bus for seven years, sponsored pep club and started a camera club. Dale continued to work on his M.S. Degree taking evening, Saturday and summer classes at Drake University accumulating 60 hours of graduate work. He also learned to fly during this time and was active in the Road Runner Flying Club, being a charter member. He also Mooney airplanes and ventured into selling stand-up golf carts, which didn’t end well after he broke both elbows doing a demo. In 1963 they moved to Hampton, and Dale taught high school Science, Chemistry and Biology. While in Hampton a flying club was organized and Dale continued his interest in flying. In April of 1964, Dale was approached by the Security State Bank of Radcliffe and offered a job in the bank and also in the insurance agency. They made the difficult decision and in July 1964 moved back to Radcliffe. Dale was Vice President of the bank and ran the insurance agency. Dale was Chief and member of the Radcliffe Volunteer Fire Department for 43 years, serving as Chief for 26 of those years, a faithful member of Our Savior’s Lutheran Church for 63 years serving as treasurer, singing in the choir, charter member and secretary of the Radcliffe Investment Club, charter member of over 35 years of the Radcliffe Kiwanis Club and member of the Road Runner Flying Club. After Dale’s retirement in 1999 Dale and Adoline delivered 100 Winnebago Motorhomes to dealers all over the U.S. visiting with family and friends along the way. He also kept busy with the Blood Drive, Dictionary Program for Kids, Radcliffe Improvement Committee, as Building Inspector…and wherever he was needed. Dale died on Tuesday, October 16th at the Hubbard Care Center. Those remaining to cherish his memory include his five children Randy (Betty) Martinson of Hubbard, IA, Rhonda (Jack) Frans of South Bend, NE, Rick (Mary) Martinson of The Dalles, OR, Reggy (Donna) Martinson of Vancouver, WA, and Rory (Joyce) Martinson of Spirit Lake, IA; 12 grandchildren; 10 great-grandchildren; sister Elaine (Chick) (Jack) Thurston of Forest City, IA; brother-in-law Duane (Bud) (Jean) Maakestad of Fairmont, MN; along with other numerous relatives and friends. Dale was preceded in death by his parents, wife Adoline and sister Mary Ann Evans. To send flowers or a remembrance gift to the family of Dale Martinson, please visit our Tribute Store. "Email Address" would like to share the life celebration of Dale Martinson. Click on the "link" to go to share a favorite memory or leave a condolence message for the family.